Irvin Gomez, a 26 year old man, is wanted for a $50,000 felony criminal bench warrant for narcotics, and a $20,000 misdemeanor criminal bench warrant for resisting arrest. Gomez is 6’00” and weighs 280 lbs. He frequents the area of Don Avenue and Antoine Court. The Stockton Police Department is encouraging citizens to call if they have information pertaining to Gomez’ whereabouts. Callers are asked to call the Stockton Police Department at (209) 937-8377, the Investigations Unit at (209) 937-8323 – attention: Detective Nicky Ezell or Detective David Givens, or Crime Stoppers at (209) 946-0600. Callers can remain anonymous. 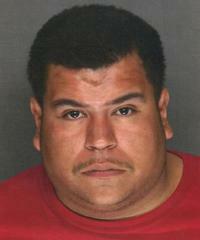 If you have any information that may lead to an arrest call Crime Stoppers at (209) 946-0600. Crime Stoppers pays cash rewards up to $10,000.